Even then the challenge wasn’t over, the Aston Martin Vantage staying close enough to take advantage of any mistake ahead - Sadly for R Motorsport none would come but they would finish the race in a fine second place just three seconds back, well ahead of a spirited battle for third. It would be Aston Martin’s best ever finish at the race. 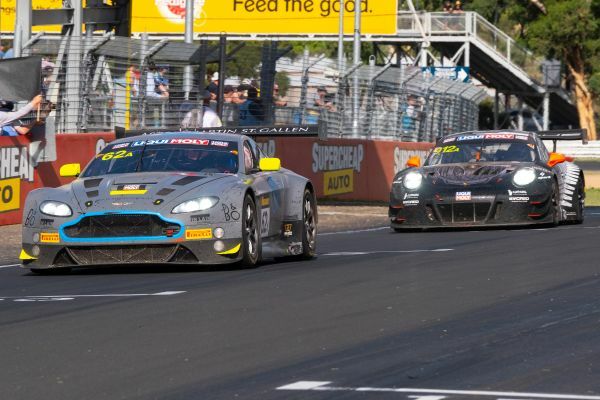 Jake Dennis, Driver of #62 Aston Martin Vantage V12 GT3: "It’s a mark of just how well that went that a crew of Bathurst rookies is actually feeling disappointed with second place. We pushed hard all day and kept the car in the hunt, the team effort was huge, we always knew there were teams with experienced drivers here, and newer cars, that would bring a big challenge. Our speed though was good all day and I’m pretty sure that if we hadn’t had the late Safety Car we could have brought home the win. By the end the brakes were just about finished, it was a shame to lose the lead to a move, but after that all I could do was stay close and hope for another opportunity. This place, and this race though are amazing, we’ll be back I’m sure - now though we are all looking forward to the new car, and to taking on the Blancpain Endurance Championship." Marvin Kirchhöfer, Driver of #62 Aston Martin Vantage V12 GT3: "That was a tough race, a really stacked field and hard racing all day. There was a lot of green flag running and every position had to be fought hard for. The team did a brilliant job, that helped to keep us in the hunt, and Matt and Jake drove amazingly well. Second place is an odd feeling, a better result than perhaps we felt was possible earlier in the week, but ultimately you can’t help thinking what might have been." Matthieu Vaxiviere, Driver of #62 Aston Martin Vantage V12 GT3: "I’m actually quite amazed to be sitting here having finished this well but a huge amount of credit goes to the whole team for giving us a car we could take the fight to the rest with. This race has a reputation for being one of the toughest - that absolutely was the case. A win would have been amazing but for now we should be delighted with what has been achieved." Dr Andreas Baenziger, Team Co-owner R-Motorsport and driver of #760 Aston Martin Vantage V12 GT3: "I still don’t know exactly how the crash happened. We’ll have to look at the data in detail before we can tell you more. What’s important is that I was able to return to the team unhurt after being checked out in the Medical Centre. I have the Aston Martin Vantage V12 GT3 to thank for that. It’s a really solid car, and we were back racing again with it after a break for repairs of less than five hours." Dr Florian Kamelger, Team Principal at R-Motorsport and Driver of #760 Aston Martin Vantage V12 GT3: "What a weekend we’ve had in Bathurst! We took second place overall and didn’t lose the race. That’s a great result ultimately after all the ups and downs. Our team did a fantastic job under tough conditions, as we were bumped down the field from pole position to twelfth on the grid, which made the start difficult. Our strategy was perfect and Jake, Marvin and Matthieu got everything out of our Aston Martin V12 GT3 on its final outing. Unfortunately, we had a bad smash with our second car in the ProAm category, car #760, which was without serious consequences for my friend and business partner Andreas, luckily for him and us! The car was pretty badly damaged, but our team had it ready to race again in less than five hours. 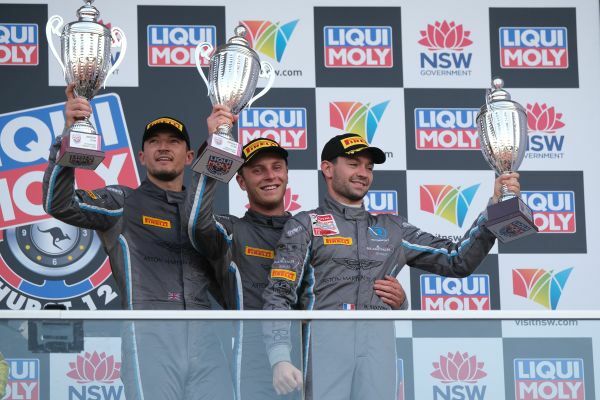 The result, second place for our Pro car is a terrific outcome for everyone in the team after working so hard."